Please bring new or gently used books for elementary-age children — or cash to purchase them — to St. Paul’s between April 22 and 29. These will be given to MacGregor elementary students to help them keep up with their reading over the summer. Students lose three months of reading progress when they don’t read over the summer. Many MacGregor students don’t have books at home. 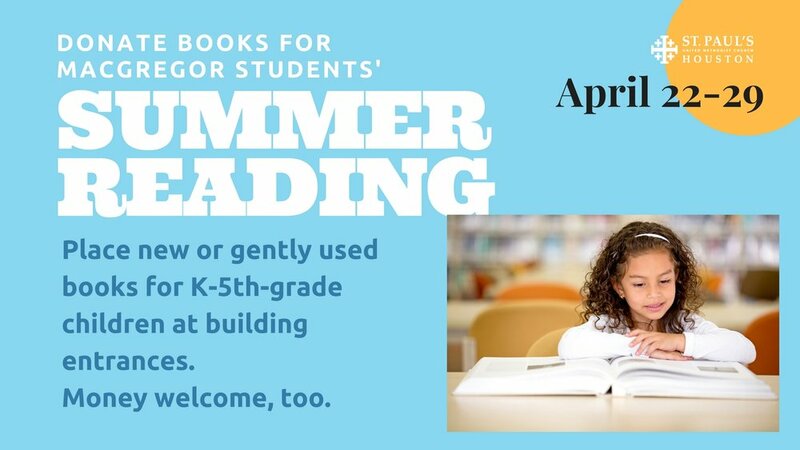 Those we collect will help them keep up with their reading over the summer. According to the Barbara Bush Houston Literacy Foundation, reading below expected third grade levels is highly correlated to future academic challenges as well as dropout, incarceration, and poverty rates.